Wallpaper has come a long way. To me, it used to come w/ a tacky connotation….the busy flower type that you would usually find in grandma’s kitchen. The ones that make you dizzy after 5 secs of glancing at them. 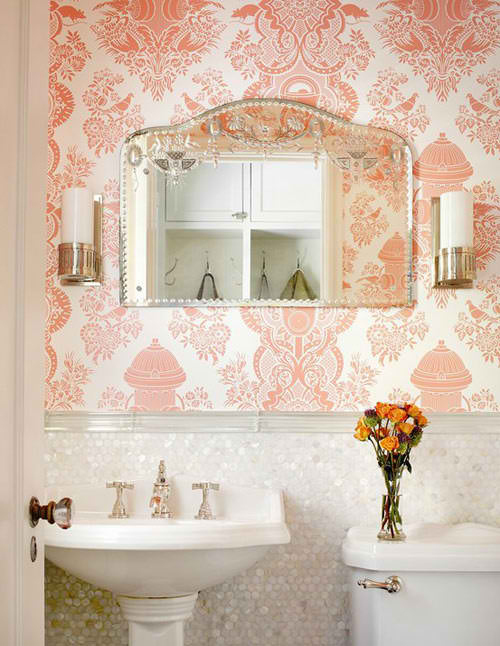 Nowadays, wallpaper designs come in many stylish patterns. The kinds that would transform your house to one of luxury in a matter of mins (or days) depending how fast you can install them. I am currently loving the damask wallpaper patterns. As you may already know, I am currently obsessed w/ the Parisian look and to me, nothing spells vintage Parisian luxury like damask wallpaper (and of course an awesome French Provincial Chair). Below is a FAB combo of the two. Image source here. And then there are the Flocked Velvet kind that has a velvet texture. Talk about super luxurious! As seen below, image source here. I am DYING to have a wall of damask pattern in our home. Maybe for an accent wall in the bathroom (as seen below)? More desperately, I want a damask accent wall in our bedroom, behind the white silk headboard. I think this will be the PERFECT addition to our bedroom! The goal is to convince the husband that it’s well worth it. He’s had a bad experience taking off wallpaper in the past thus the reluctancy. However, if we have a gorgeous wall of damask pattern, I can’t imagine having to remove it. EVER. Yes, sometimes I have a mind of a child. Actually, there are some logic behind this want (turning into a NEED soon!) of mine. We already have some damask decor pieces in our bedroom so a damask wall will bring it all together! Below are some inspiration pictures of damask wallpapers in the bedroom. Image source here. 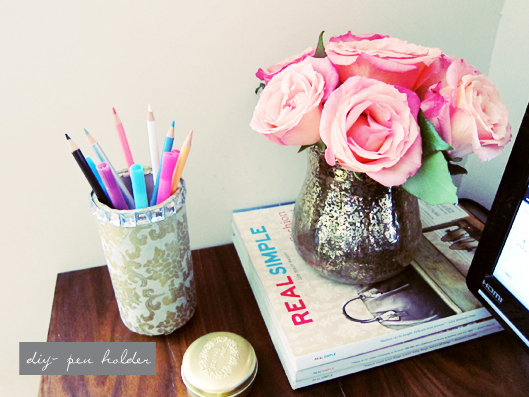 Do you have wallpaper in your home? If not, would you consider a damask pattern? Please share! Yes, I’ve wallpaper lining one wall in my bedroom, and a different one lining another wall in my living room. They’re not damask designs because they wouldn’t match our furniture. I’m not sure if I’ll go for damask designs since I’ve a preference for tropical furniture, especially Balinese (since I live in the tropics), or mixing a signature chic modern Italian furniture (Poltrona Frau for instance) with clean-line Ming pieces. So the wallpaper (if any) will have to complement them. LOVE demask and fell in love with the pattern when I was planning my wedding a few years ago – BEFORE this trend blew up! It’s great to see it everywhere now. It’s so classy when done right! Paint wall behind bed a nice soft flat white, add 6-12 inch stripes (spaced 12 inches apart) in clear polyurethane with a semi-gloss finish. On the flat white stripes, use damask stencils with the semi-gloss poly to create “damask stripes.” Keeping the wall behind the bed all white makes it less overpowering yet it lets the headboard and the art panels above it pop out very nicely. Great blog. Looking forward to reading more. Thank you for stopping by my blog. 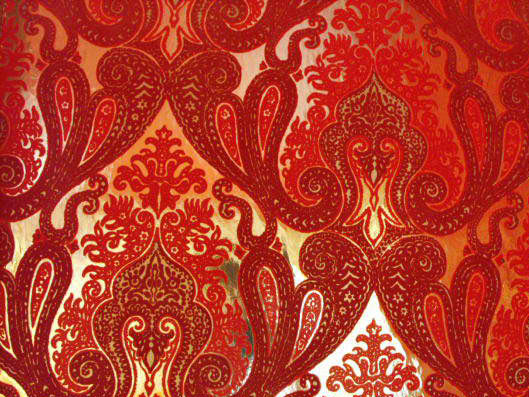 I am fond of this pattern as well, Damask is very unique and ornate with duplicate patterned styles. I thought of this pattern from the Victorian times. 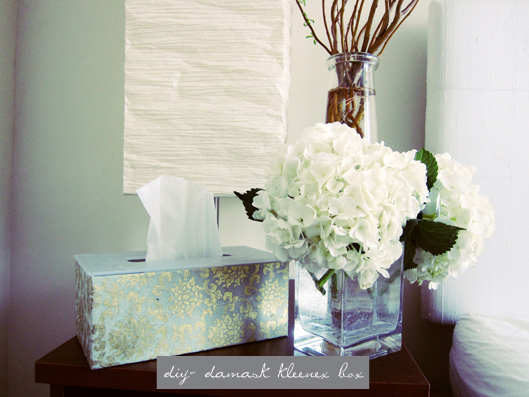 I love Damask wall paper in light colors or silver and gold. It’s so pretty and feminine. My bedroom is also my craft and junk room so needless to say it needs a make over very badly. Thanks for liking my art blog. I only had a little time to check out your blog in turn this morning, but I like what I see. A nice balance of beautiful pictures and original text – it’s like heaven! Just fantastic. They immedietly bring a lot of depth to a room! I would love to put damask wallpaper in our bedroom and dining room, but we can only paint since we live in a parsonage. Sigh… Our bedspread is turquoise ad brown damask print though and I love it! I would love to do the dining room in a rich plum cream damask with silver accents. That was plum and cream… I also meant to add that I think the damask wallpaper behind your headboard would be fabulous! I think an aged gold would suit your style well. Damask wallpaper is tres chic! I recently applied a white on white pearlescent damask wallpaper to my bedroom walls, along with lots of white moulding (chair, picture frame, and crown). The subtle pearly sheen of the damask wallpaper and architectural elements of the moulding give my all-white room lots of texture and character. Lovely post! 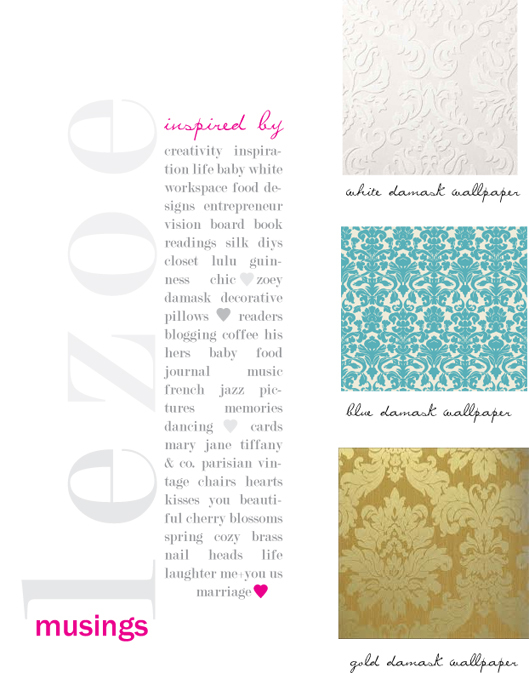 I love damask, I just love it. I like damask, it has a very pleasing shape, but I prefer it as a wrapping paper or on smaller things, I’ve never been keen on it as wallpaper. However the gold on gold damask does put me in mind of a stately home. We have a beautiful black and gold damask in our sitting room. It was a great decision! Tell your husband that lots of the new wallpapers come off very cleanly and easily, in one big strip 🙂 Go for it!! 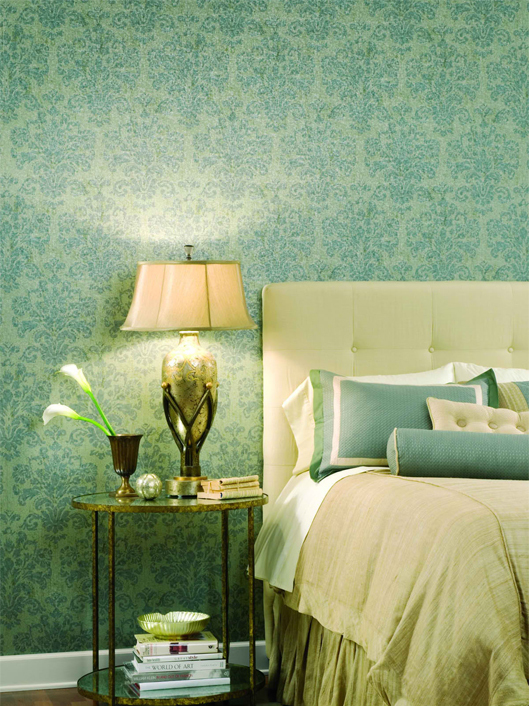 I LOVE the idea of having an accent wall in the bedroom of damask wallpaper! love your bedroom photo! and a muted damask would look great behind the bed! maybe stenciling would be an easier idea to convince the husband of 🙂 paint isn’t as hard to remove or as expensive! I have been thinking about what I could do to my bedroom to make it look fantastic and I just got a bolt of inspiration from your post….thanks!! !